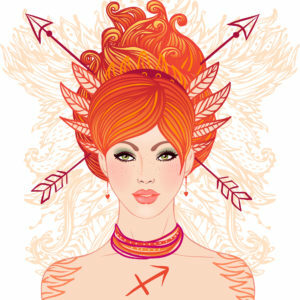 Sagittarius Sun natives tend to be idealistic, optimistic, dependable, open-minded, friendly, honest and versatile. But, they can also be tactless, irresponsible, showy, boastful, self-righteous, arrogant, quarrelsome, fanatical, dogmatic and dictatorial. Sagittarius natives like any work where foresight and a willingness to take a chance is offered, while at the same time, they try to avoid detailed work. Sagittarius Sun natives are usually outspoken, sometimes to the point of bluntness. Simply blurting out their ideas and opinions is due to their never-ending search for truth and wisdom. Others think Sagittarius natives are pretty tactless and the statement that “truth hurts” fits their way of thinking. Regardless of their undiplomatic remarks, others instinctively feel as if the Sagittarian means them no real harm and is only interested in raising their consciousness. Sagittarius natives love the outdoors, large animals, nature and sports. Some have reckless gambling tendencies and will bet it all on the drop of a hat. Travel and even long walks appeal to them because they make the Sagittarian feel free – and he needs to feel free. Sagittarius natives are philosophical and they want to understand the deeper issues and abstractions of life. They have a certain faith in higher things that generally always keeps them of an optimistic bent, no matter what difficulties are currently besetting them. They want to understand the meaning of life. This helps to keep them growing and expanding, which is something they need to do. This desire for expansion can cause them to overextend themselves with too many activities and to use up their energy too rapidly. They need to take intervals of rest to recuperate between projects. Sagittarius natives need to learn how to concentrate on their current projects and stick with them to the end. Always full of enthusiasm, they tend to show it more at the start of new endeavors, then it tends to lessen as the project goes along and gets stuck in details, or the going gets a little rough, or it simply gets a little boring. Although Sagittarius natives are ordinarily healthy, they can run into trouble due to overindulgence in food and drink. Sagittarius natives are known for their friendliness, helpfulness and subtle humor. They are good conversationalists and enjoy debating merely for the sake of debating. They have a real gift for making friends and the typical Sagittarian can go anywhere in the world without ever feeling lonely, for they acquire friends along the route. They have humanitarian instincts and are practical in expressing them. They will tend to help anyone who is in need. You can usually depend on their loyalty and honesty, for there is nothing devious or manipulative in their nature. Sagittarius natives are extremely independent and restless, with a real need for personal freedom. They can experience claustrophobia, either physical or emotional. This is why they are reluctant to get into total commitment situations and often shy away from marriage. In love, Sagittarius natives are highly romantic, but they need their partner to be intelligent and communicative. They hate jealousy and possessiveness on the part of their partner, especially since they are fond of flirting. They enjoy the chase more than the capture. Career wise, Sagittarius natives are reluctant to become tied down to a set schedule, so will experiment with a variety of jobs. They do best in careers that permit them to travel about, either locally or widely. They also like dealing directly with people, either selling or promoting ideas, products, etc. If you have the Moon in Sagittarius, you are independent, outspoken, open, generous, enthusiastic, idealistic, inspired, and optimistic and these qualities attract many friends and acquaintances. You seem to thrive on travel, sociability, fellowship, and expressing your opinions to whomever will listen. In addition, you are adventurous, playful, freedom-loving, and always ready for a good time. You rarely allow difficulties to keep you down, for no matter how bleak the past or present, you always expect a better, brighter future. In fact, you are uncomfortable with your own or other people’s problems and emotional pain. You often try to “cheer up” or offer philosophical advice to those who are hurting, but unwittingly you avoid or ignore the emotions involved. Friendship means a great deal to you, perhaps even more than love or romance. For you to be happy, your mate must be your best friend and encourage your aspirations and ideals. You also need a great deal of emotional freedom and mobility. On the negative side, you may be rather intolerant, closed-minded, dogmatic, arrogant, non-objective, risk-taking, or possess a holier-than-thou attitude. People with Sagittarius rising tend to be idealistic, aspiring, enthusiastic, religious or agnostic, interested in far away places and cultures or ideas, physically active, risk-taking, outgoing, breezy, extroverted, philosophical, perhaps dogmatic, prejudiced, superficial, looking for greener pastures, and on-the-go. Sagittarius, the Centaur, is half-human, half-animal and this is perhaps the way you are. You have great aspirations, yet may have a most unruly desire nature. You can shoot for the stars or wallow with the animals. There is love of animals, the outdoors, sports, gambling, adventure, and travel. You may lack concentration. You probably have many acquaintances, but few friends. You tend to have casual contacts rather than in-depth relationships. You have a great restlessness and a love to be on the move. You may always be looking for greener pastures, never stopping or slowing down to see where you really are and what’s around you. You tend to be talkative and direct and to the point. You may be lacking in tact and diplomacy due to your frankness. Ideas are very important to you. You generally like working with the big picture and dislike all the little details. You may promise much and deliver less. You can rise to the heights or sink to the depths. Which will you choose? Spiritual lesson to learn: Restraint, of all that is given away (and stop procrastinating). Jupiter rules Sagittarius so Jupiter will be important in your chart.